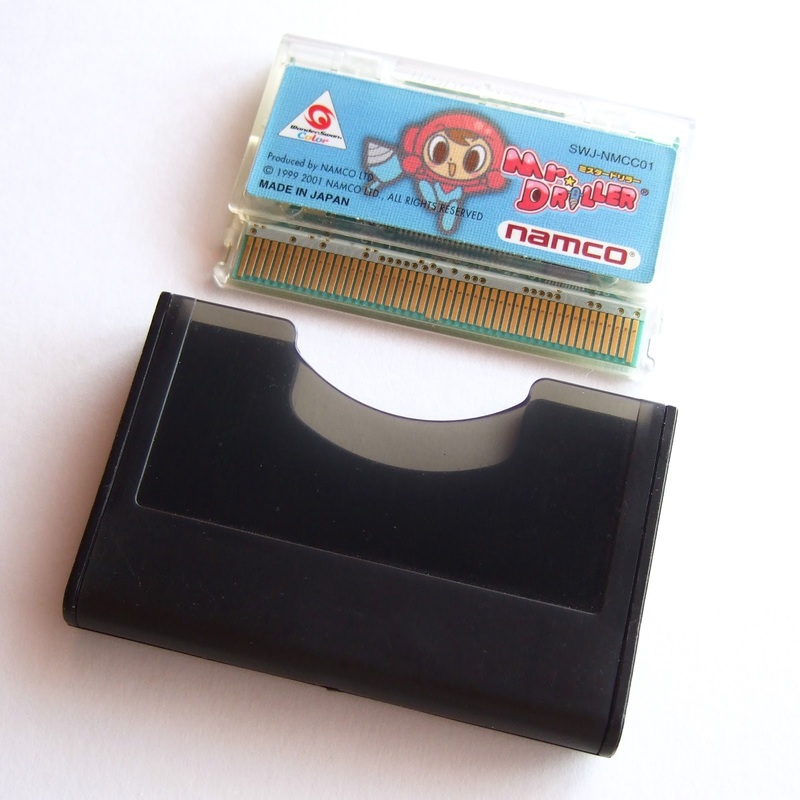 Three WonderSwan-focused posts in a row? Seriously? In the meantime, I hope you'll enjoy ogling the following photos I recently snapped of my WonderSwan Color system and a selection of the WonderSwan games I brought on the road with me this year. I took these photos in a Palm Springs (California) hotel room, by the way. Its decor didn't exactly lend itself well to such snapshots, so I improvised a light box by going to a nearby Walmart (don't judge), buying a large piece of white poster board and then laying it on a table near our room's main windows. Granted, that isn't a whole lot different from what I did to nab game and console photos back when I lived in Seattle. There, I placed items on a white, well-lit IKEA table that also effectively replicated a light box. Anyway, enough about that. 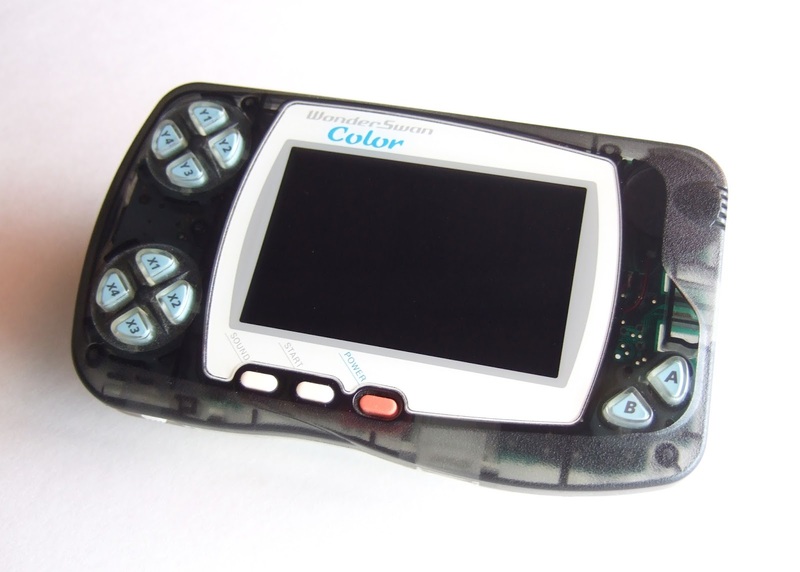 I promised WonderSwan Glamour Shots®, so let's focus on them from here on out, shall we? 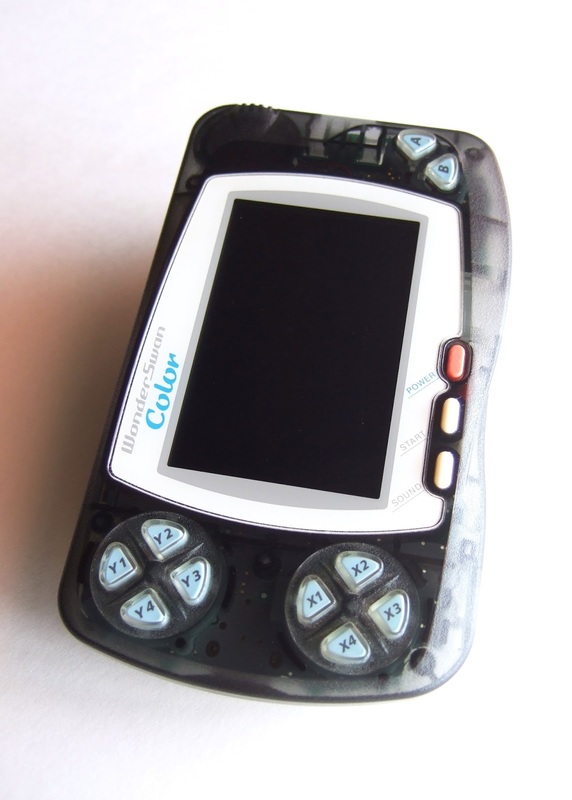 The first two showcased here are of my translucent black WonderSwan Color system. It's a real beauty, isn't it? Honestly, I'm head-over-heels in love with this handheld's design. Strangely, I think I like the look of the original WonderSwan best (it's a tad sleeker and smidge more minimalist than its two successors), but the Color is pretty sweet, too. Sadly, I've yet to cover the game shown off in the photo above in one of these posts or anywhere else on this blog, but I guarantee I'll do so sooner rather than later. 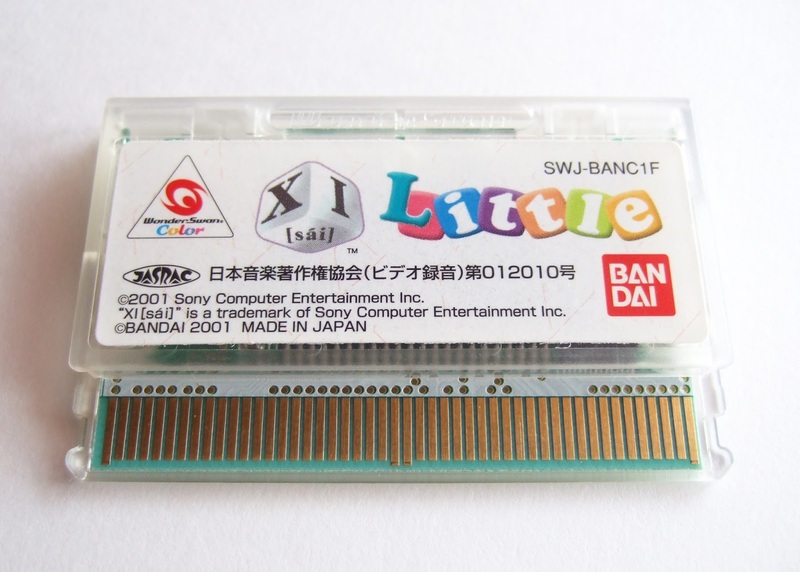 The game is Xi Little, by the way. 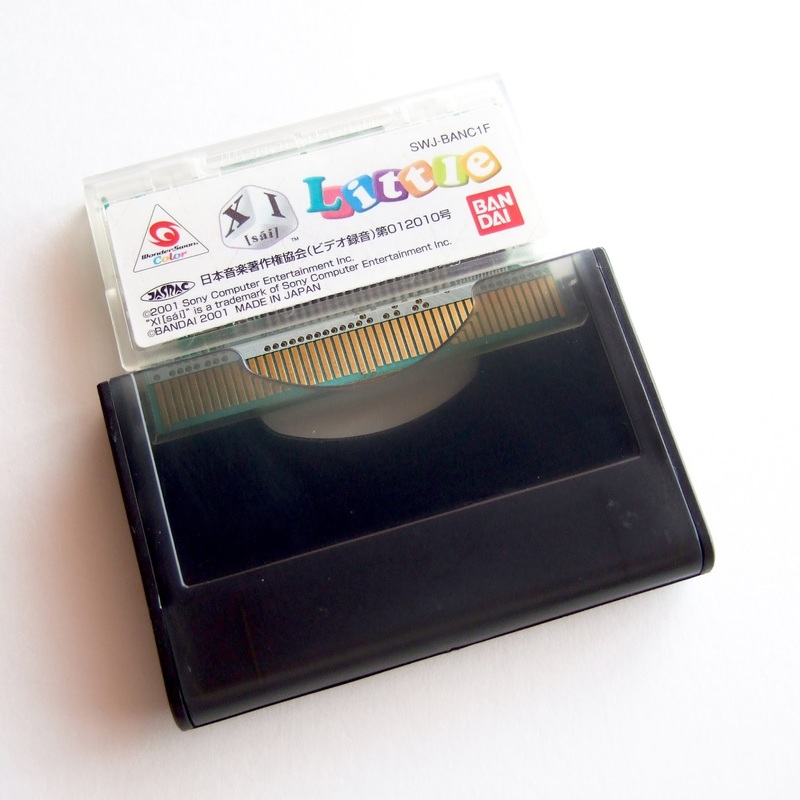 It's a portable version of the PlayStation puzzler known outside of Japan as Devil Dice. Why did I take another photo of Mr. Driller's cartridge, below, when one's already included in the Flickr photo album I mentioned a few paragraphs ago? To be honest, I'm not that fond of my earlier shot. 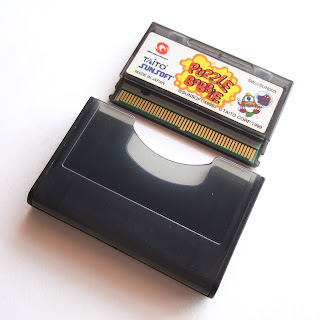 Plus, I really like this game's cart label wanted to highlight that a bit more in updated capture. The same is true of the Puzzle Bobble photo you can see earlier in this post. I offered up a handful of shots of that game's box, cartridge and manual in my most recent "Nice Package!" post, but I thought one more couldn't hurt so I snapped the one you see here. 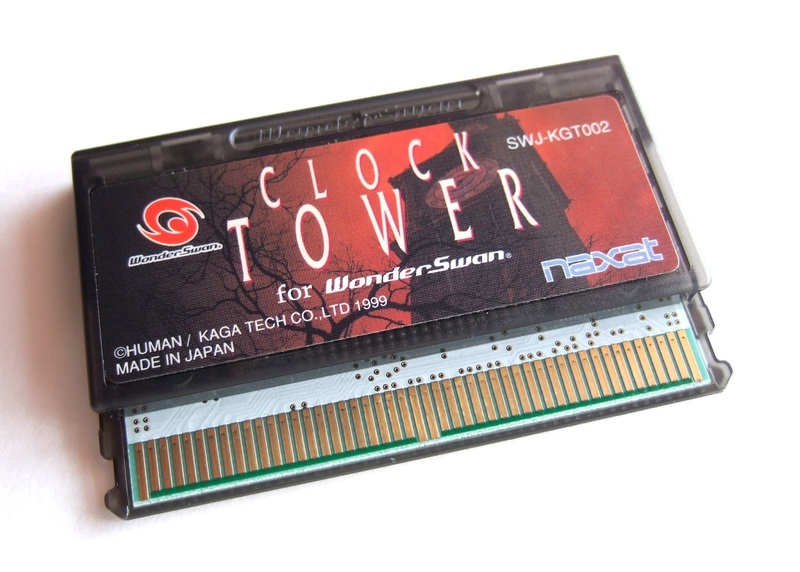 I'm also not a fan of the snapshots I took of the Clock Tower for WonderSwan cartridge some time ago, so the pair that follow are an attempt to make up for those missteps. 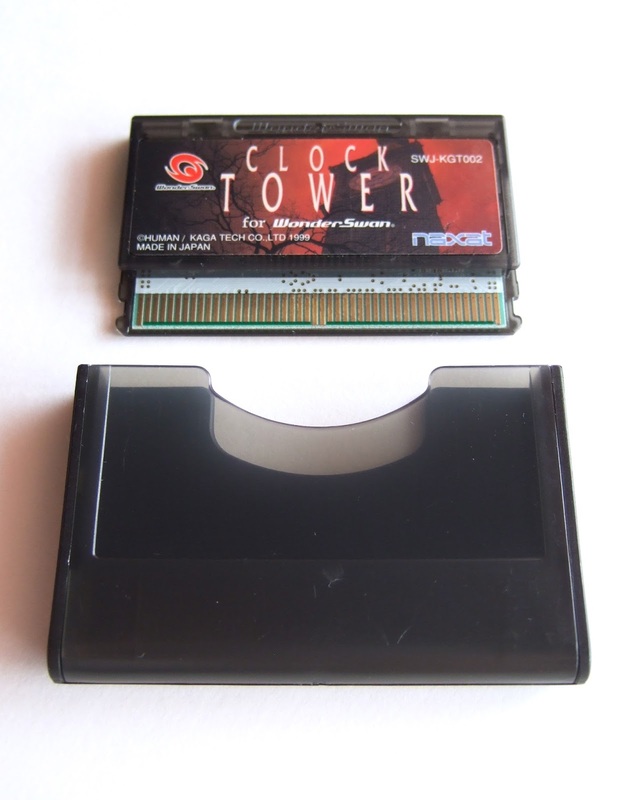 I don't know about you, but I really like how the photo above gives you a good look at this cart's spooky label. Unfortunately, you'll encounter no red skies should you play this port of Human Entertainment's classic survival-horror game, as it's a strictly black-and-white affair. If you'd like to learn more about how Clock Tower for WonderSwan compares to the Super Famicom original or the PlayStation port that hit Japanese store shelves two years later (and two years before this handheld offering), you can do so here. Finally, there's a shot of 10 WonderSwan and WonderSwan Color cartridges sitting nestled in their little plastic sleeves. 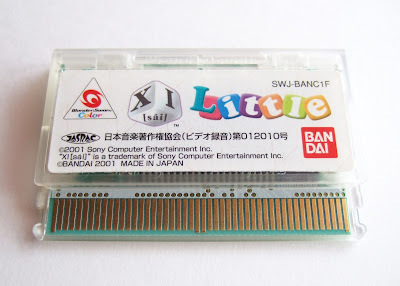 It doesn't display the extent of my WonderSwan game collection. A number of Squaresoft releases are missing, as are a couple of titles I failed to bring with me on sabbatical. 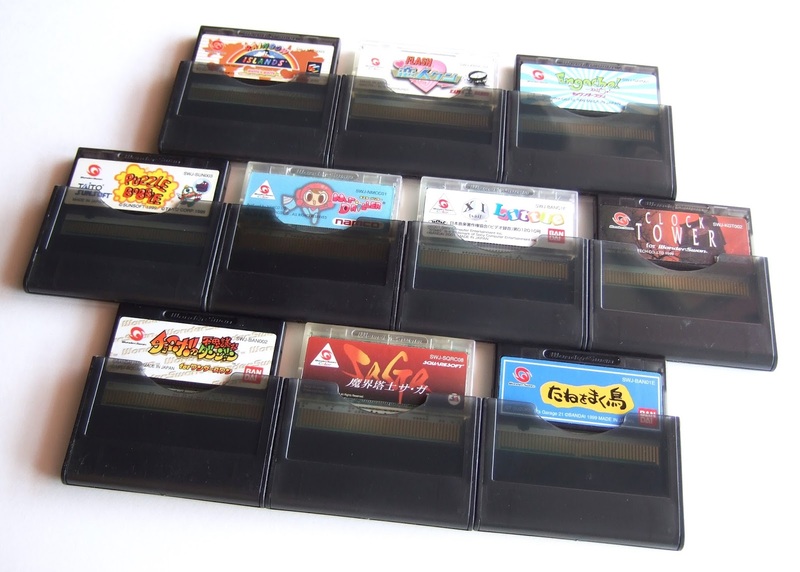 Still, my (current) favorites--such as Tane wo Maku Tori, Rainbow Islands: Putty's Party and Engacho!--are all present, so don't expect me to get too worked up over the AWOL carts.